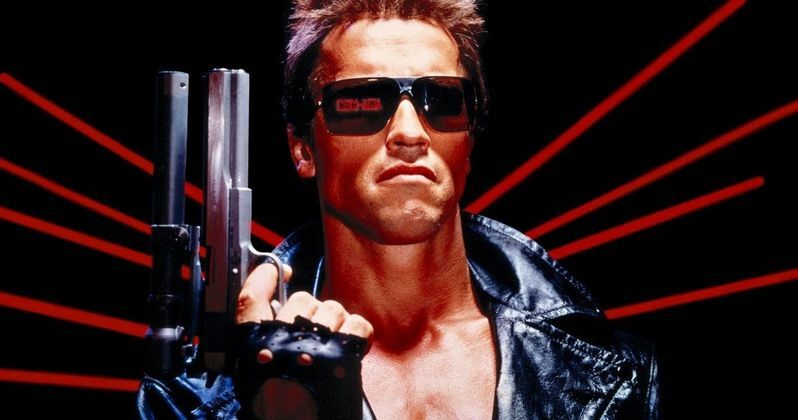 With certain rights to the iconic Terminator franchise reverting back to Terminator and Terminator 2: Judgment Day creator/director James Cameron in 2019, the filmmaker is prepping his return to the series. Cameron is planning to 'Godfather' a 'reboot and conclusion' of the first two movies, with Deadpool director Tim Miller in early talks to direct. David Ellison, who bought the franchise rights from his sister Megan Ellison in 2013, is funding an "exploratory effort" that brings some of the top sci-fi authors together to "find the movie creatively." Deadline broke the news, but even the site concedes that it's unclear what direction the story will go in. After directing 1984's The Terminator and its blockbuster 1991 sequel Terminator 2: Judgment Day, James Cameron backed away from the franchise, and he wasn't involved in 2003's Terminator 3: Rise Against the Machines, the 2008 TV series Terminator: The Sarah Connor Chronicles, 2009's Terminator Salvation or last year's Terminator Genisys. He did, however, appear in a few TV spots, praising that movie, although it didn't seem to help, since it was a critical failure while underperforming at the box office. It was always known that James Cameron would retain control of the franchise in 2019, 35 years after the original Terminator movie was released, which is why Paramount set up release dates for Terminator Genisys 2 (May 19, 2017) and Terminator Genisys 3 (June 29, 2018) before Terminator Genisys was even released. Oddly enough, exactly one year ago today, Paramount Pictures yanked the release date for Terminator Genisys 2. In March, Arnold Schwarzenegger insisted that this sequel was still happening, but that doesn't seem to be the case anymore. It remains to be seen if Arnold Schwarzengger will return as the T-800 for this untitled project. Even though James Cameron isn't directing, his creative involvement in this new, and currently untitled Terminator movie, is quite exciting for die-hard fans of the franchise. Deadline even speculates that this new project could either reboot the entire Terminator franchise, orsimply pick up from where Terminator 2: Judgment Day left off, which would most likely erase everything that came after it from the franchise timeline, much like how Bryan Singer wiped out the events from 2006's X-Men: The Last Stand by creating a new timeline in the 2014 hit X-Men: Days of Future Past. Which is kind of what Terminator: Genysis attempted to do with its time travel story. This report goes onto say that James Cameron once mentioned his plans to buy back the Terminator rights to producers Mario Kassar and Andy Vajna, from their bankrupt company Carloco. The producers beat the director to the punch, buying the rights themselves and bringing Carloco back as C2 Pictures. They went on to producer Terminator 3: Rise of the Machines, which earned $150 million domestic and $433 million worldwide, from a massive $200 million budget. C2 folded in 2008, with Halcyon controlling the rights until they were sold to Pacificor in 2010, for a whopping $29.5 million. Producer Megan Ellison bought the rights for $20 million just a year later, before she sold them to her brother David Ellison in 2013. After breaking box office records with the R-rated Deadpool, Tim Miller backed away from the sequel Deadpool 2, reportedly due to creative differences with star/executive producer Ryan Reynolds. The filmmaker has also signed on to develop and executive produce an adaptation of the Sonic the Hedgehog video game, but he will not be directing, with his Blur Studios partner Jeff Fowler making his directorial debut with Sonic the Hedgehog. Hopefully we'll hear something official from James Cameron and Tim Miller about the development of this new Terminator movie.